Early KYW-TV 3 Logo-1956-57 era. The Westinghouse/NBC Cleveland TV-Radio properties swap became official November 1955 with WNBK/WTAM call letters changing to KYW/KYW-TV, respectively at Noon Monday, January 13, 1956. Westinghouse almost immediately complained to the FCC about NBC's "strong-arm" tactics forcing the move. In the midst of this, 13 Westinghouse executives set up shop in Cleveland. To their credit, they set out to make The KYW properties great stations. They made a big splash immediately with balloons, celebrations and getting the new KYW name out there as much as possible, which we will document on the Facebook Page this week. New KYW-TV Logo-Introduced January 1961. 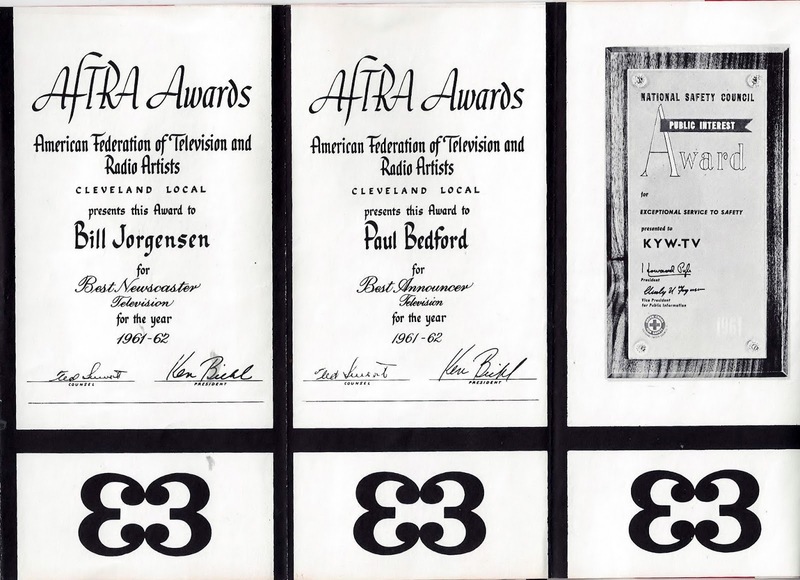 As a result of the efforts revitalizing KYW-TV, The American Federation of Radio Arts and Sciences gave KYW 9 awards at their 1961-62 awards program held June 4, 1962. 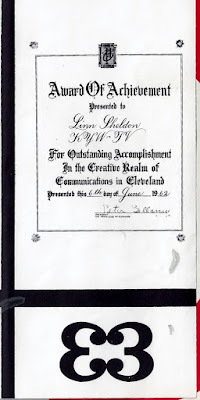 Below as a part of a Russell W. Kane Plain Dealer article is a summary of the complete awards program.. 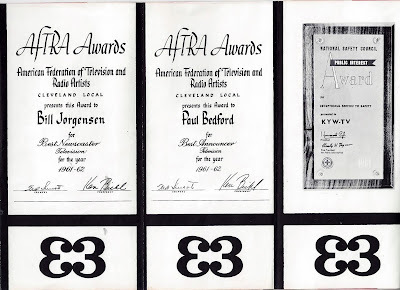 Which leads us to the reason for the post today..On ebay I found a banner with all the awards listed. It appears to be either something used in house by KYW-Westinghouse..Or something as part of a Industry Magazine ad or special section..Havent been able to figure out exactly where it was used..Or who the people are that gave the awards..Below are all the awards as posted on the banner in order.. 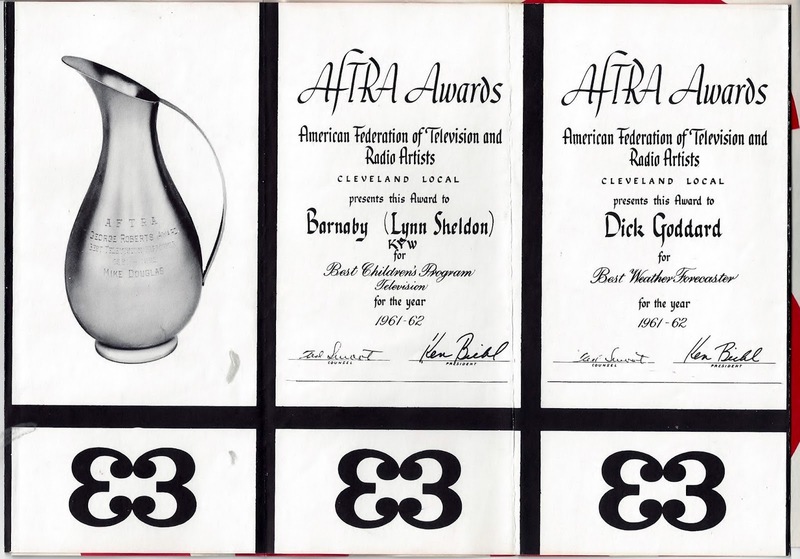 Some great names there..In recent years, the Screen Actors Guild merged with AFTRA to form one Union. 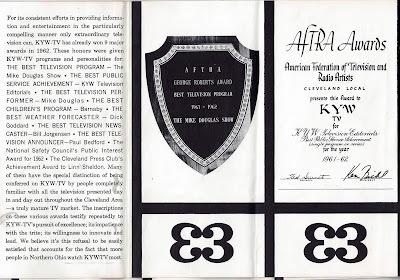 Cleveland was eventually folded into Pittsburgh Ohio SAG-AFTRA..
KYW-TV/Radio continued their reputation for excellence in Cleveland Broadcasting until 1965, when the FCC reversed the original swap and KYW Became NBC owned WKYC. This is great glimpse into the past of when KYW was at its best serving Cleveland and Northeast Ohio..